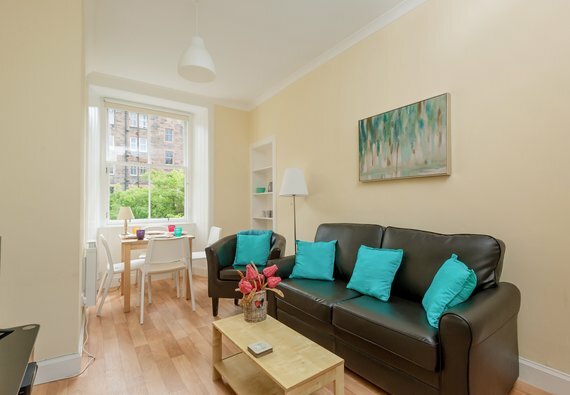 The Watson Crescent Apartment is a bright first floor apartment, overlooking the quiet rear garden and beyond to the the union canal, in a traditional stone built building, located 1 mile from Princes Street the heart of Edinburgh. This self-catering apartment is fully furnished and decorated to a 4 star standard to make your stay in Edinburgh as comfortable as possible. which features a Cineworld cinema, fabulous Nuffield Health gym, Genting Casino, Tenpin bowling alley, Gravity Trampoline Park and an excellent range of restaurants, bars and pubs. As well as the main lounge area there is also a dining area suitable for four people to dine over looking the rear aspect including the garden and the Union canal. A bright airy and modern ambience is created by the choice of furniture and lighting features. A flat screen smart TV, Virgin box, DVD player and wifi internet access. This is a lovely double bedroom with a window overlooking the rear of the property so it's nice and quiet. A double bed and headboard with bedside tables, a large wardrobe provides ample storage space for your possessions. The clean and modern bathroom completes this apartment with an instant electric shower over a large bath and wash hand basin unit and WC. The fully equipped modern kitchen includes a fridge/freezer, electric hob and oven, microwave oven and cutlery & crockery for up to four guests. Sleeping arrangements King Size bedroom with double sofa bed in the lounge. Exterior The property is to the rear of the building and directly overlooks the Union canal. Interior layout Hall with open plan lounge/kitchen and dining area.Utility room off the lounge. Bedroom off hall and bathroom also with access from hall. No reviews yet for The Watson Crescent Residence.